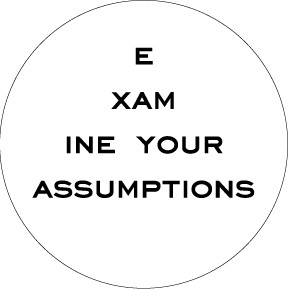 I know, we have been told not to make assumptions because it turns us and others into a naughty word. As youth workers (and any employee for that matter), we do want some assumptions to be made because it seems so many untrue assumptons are unintentially directed at us that make us uncomfortable and some times angry. I cannot speak for all youth workers, so I will speak for me and see if any any of these resonate with you. You hired me for a reason, let me take on challenges and believe I will succeed. If you do not, it is money wasted and time wasted in micro-managing me. I want you to assume I want what is best for the whole Body and not just for the youth ministry. If I am young (and I am not) I may need some help seeing the big picture. If I am older (which I am) then help remind me of Aunt Sally, in the top balcony, who has a degenerative disease and needs more exercise, and thats why we are turning the youth room into an aerobocise classroom. You notice I did not say work hard for you, but that is a given if put my priorities in the right order . If I am kingdom minded I will be about the Father’s business and ultimately yours as well. If I am not kingdom minded and you are not kingdom minded, we will be about each other’s business, and ultimately fail at both our tasks. It does not cost us anything to have a positive assumption about someone. Some of us may have to do mental gymnastics to overcome past misgivings, but in the end, a positive assumption can be a self fulfilling prophecy. If you are a Pastor, try communicating these positive assumptions you have about your youth pastor in creative and obvious ways such as allowing your youth pastor to pray for the offering, this may seem like nothing but what you are saying is, “I trust you in front of these people” and “I want other people to see you in another light.” It’s too bad many pastors hide their youth (and children’s pastors) away from others for fear of X. What assumptions could be drawn from that? In the end, I believe my Pastor does assume all this about me, and for that I am thankful, but many youth pastors do not have that luxury. The only assumption Pastors should not make about their youth pastors, and vice versus, is that we are perfect. Unless we have given you a reason, and a really good one at that, to doubt us, assume your youth pastor is for you and not against you and wants to help you build the church and not tear down it down. How about you? If you are a youth pastor do you think your pastor has positive or negative assumptions about you? If you are a Sr. Pastor, have you made the right assumptions about your youth pastor? Is there a way you can communicate that to them?